Cleveland, Ohio, Brooklyn, New York, and Shanghai, China – December 16, 2013 – Forest City Enterprises, Inc. (NYSE: FCEA and FCEB) and Shanghai-based Greenland Group Co. today announced that they have completed a definitive agreement for a joint venture to develop Atlantic Yards, a 22-acre residential and commercial real estate project in Brooklyn. The two companies had announced a memorandum of understanding for the joint venture in October. The joint venture, which is expected to close in 2014, would cover both phase one and phase two of the project – excluding Barclays Center and the first housing tower, B2 – including infrastructure, a permanent MTA rail yard, a platform above the rail yard and future residential units. The closing of the agreement is subject to necessary regulatory approvals, including the Committee on Foreign Investment in the United States (CFIUS) as well as the government of China. Under the joint venture agreement, the Greenland Group would acquire 70 percent of the project and co-develop the project with Forest City, with both organizations sharing in all project costs going forward in proportion to their ownership interests. In addition, the Greenland Group would also make a capital contribution to reimburse Forest City for certain costs incurred to date. Forest City, through its New York-based subsidiary, Forest City Ratner Companies (FCRC), would manage day-to-day activities on behalf of the joint venture, which would develop the project consistent with the approved master plan. David J. LaRue, Forest City President and CEO, said, “This agreement is an important step forward for Atlantic Yards. We look forward to welcoming Greenland Group as a partner and applaud their commitment to affordable housing, their dedication to the future of Brooklyn and New York, and their confidence in Forest City. Securing strategic partners to invest with us to activate development and create long-term value is a key strategy for Forest City. Upon closing, Greenland Group promises to be our largest such partnership to date. I want to acknowledge the fine work of our New York team on this important milestone. Under MaryAnne Gilmartin and Chris Clayton’s leadership, we have created a formidable and unprecedented strategic partnership that will allow us to move forward on one of our most important and ambitious developments. Atlantic Yards would be Greenland Group’s second project in the United States. In July, Greenland Group purchased a site in downtown Los Angeles and plans to build a hotel and residential units. The Shanghai-based developer is the number one multiple-function real estate developer in China, with projects in more than 70 cities in 25 provinces in China. Greenland Group is respected in particular for developing well designed, high-rise buildings that are part of large urban complexes built around transit and high-speed rail. Four of their buildings are among the ten tallest buildings in the world. In 2012, Greenland Group ranked 359th among Fortune Magazine’s list of the Top 500 global enterprises, 73rd among Top 500 Chinese companies, and number one among Chinese real estate enterprises. It achieved revenues of $36.6 billion and a total profit of approximately $2 billion in 2012. The definitive agreement, which was completed less than four months after Forest City and Greenland Group met at the Atlantic Yards site late this past summer, was signed by representatives of both companies at a meeting in Shanghai. Established in 1992, the Shanghai-based Greenland Group has formed a diversified industrial structure with a focus on energy, finance, and real estate. Greenland Group is involved in construction projects in more than 70 cities and provinces in China as well as in Korea, Australia and the United States, among others. Forest City Enterprises, Inc. is an NYSE-listed national real estate company with $9.3 billion in total assets. The Company is principally engaged in the ownership, development, management and acquisition of commercial and residential real estate and land throughout the United States. For more information, visit www.forestcity.net. Statements made in this news release that state Forest City’s or its management’s intentions, hopes, beliefs, expectations or predictions of the future are forward-looking statements. The company’s actual results could differ materially from those expressed or implied in such forward-looking statements due to various risks, uncertainties and other factors. Risks and factors that could cause actual results to differ materially from those in the forward-looking statements include, but are not limited to, the impact of current lending and capital market conditions on its liquidity, ability to finance or refinance projects and repay its debt, the impact of the current economic environment on its ownership, development and management of its commercial real estate portfolio, general real estate investment and development risks, using and investing in modular construction as a new construction methodology, vacancies in its properties, further downturns in the housing market, competition, illiquidity of real estate investments, bankruptcy or defaults of tenants, anchor store consolidations or closings, international activities, the impact of terrorist acts, risks of owning and operating an arena, risks associated with an investment in a professional sports team, its substantial debt leverage and the ability to obtain and service debt, the impact of restrictions imposed by its credit facility and senior debt, exposure to hedging agreements, the level and volatility of interest rates, the continued availability of tax-exempt government financing, the impact of credit rating downgrades, effects of uninsured or underinsured losses, effects of a downgrade or failure of its insurance carriers, environmental liabilities, conflicts of interest, risks associated with the sale of tax credits, risks associated with developing and managing properties in partnership with others, the ability to maintain effective internal controls, compliance with governmental regulations, increased legislative and regulatory scrutiny of the financial services industry, changes in federal, state or local tax laws, volatility in the market price of its publicly traded securities, inflation risks, litigation risks, cybersecurity risks and cyber incidents, as well as other risks listed from time to time in the company’s SEC filings, including but not limited to, the company’s annual and quarterly reports. (Brooklyn, NY) – December 23, 2009 – Bruce Ratner, the Chairman and CEO of Forest City Ratner Companies (FCRC), the developer of Atlantic Yards in Brooklyn, announced today that FCRC, the Empire State Development Corporation (ESDC), the Metropolitan Transportation Authority (MTA), the City of New York, and other parties have executed all necessary documents and officially closed on the project. While construction on the Barclays Center and the project site in downtown Brooklyn has commenced and is ongoing, today’s closing includes the issuance of bonds and the execution of various real estate documents, including the arena lease, financing, development, and purchase and sale agreements. To date, 35 buildings, roughly 56% of the structures on the site, have been demolished and construction of the temporary rail yard has been completed. Removal of the Vanderbilt Yard tracks and critical upgrades to the sewer and water infrastructure in the area are underway. Mr. Ratner thanked the Governor, the Mayor, the Brooklyn Borough President, ESDC, the MTA – Long Island Rail Road and the vast majority of the people of Brooklyn and New York who have stood by us and have long believed in the benefits and promise of Atlantic Yards. Atlantic Yards will create close to 17,000 union construction jobs, as well as 8,000 permanent jobs once the project is complete. The project involves the redevelopment of 22 acres in downtown Brooklyn, which will include approximately six million square feet of residential space (6,430 units of affordable and market-rate housing), an 18,000-seat sports and entertainment arena to be known as the Barclays Center, 247,000 square feet of retail use, approximately 336,000 square feet of office space, and eight acres of publicly accessible open space. FCRC and the Nets today also have placed branded signage along fencing at the arena construction site, which includes logos of the major partners of the Barclays Center. Those partners include Barclays, which is the naming rights partner, along with ADT, Cushman & Wakefield, EmblemHealth, MGM Grand at Foxwoods, Anheuser-Busch, High Point Solutions, IZOD, Jones Soda, and MetroPCS. Brooklyn, NY – November 24, 2009 – Bruce Ratner, CEO and Chairman of Forest City Ratner Companies, issued the following statement today regarding the NYS Court of Appeals ruling in favor of the Atlantic Yards project in Brooklyn. 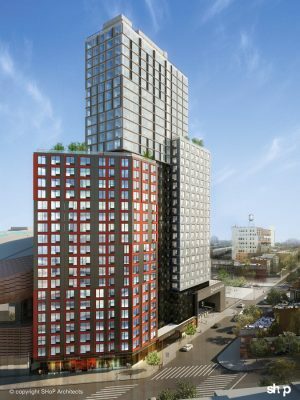 The Court’s ruling upholds the State’s right to use eminent domain given the public benefits associated with the Atlantic Yards Development in Brooklyn. Mr. Ratner said construction activity on the yards will continue, with the intent that the Nets will play ball in the Barclays Center in the 2011-2012 season. In addition to Barclays, which has the exclusive naming rights, eight companies have signed on as founding partners for the arena. The courts have ruled consistently in favor of the development. Mr. Ratner explained as well that the arena and larger development are expected to create 16,924 union construction jobs and over 8,000 permanent jobs. The tax revenues that will be generated for the City and State during the construction period are expected to exceed $240 million and after construction reach approximately $70 million a year. (Brooklyn, U.S.A. and Moscow, Russia) – September 23, 2009 – Forest City Ratner Companies (“FCRC”), Nets Sports and Entertainment (“NSE”) and Onexim Group announced today that they have signed a letter of intent to create a strategic partnership for the development of the Atlantic Yards Project, a 22-acre residential and commercial real estate project in Brooklyn and the Barclays Center, the future home for the NBA’s Nets. This partnership will ensure the successful completion of a world-class entertainment venue in Brooklyn, the relocation of the NBA Nets basketball team and the economic and housing benefits of the Atlantic Yards Project. In accordance with the agreement, entities to be formed by Onexim Group will invest $200 million and make certain contingent funding commitments to acquire 45% of the arena project and 80% of the NBA team, and the right to purchase up to 20% of the Atlantic Yards Development Company, which will develop the non-arena real estate. The transaction is expected to close by the first quarter of next year upon certain conditions being fulfilled, including approval by the NBA’s Board of Governors. The Raine Group and Goldman, Sachs & Co. advised FCRC and NSE. Simpson Thacher & Bartlett LLP acted as legal counsel to FCRC and NSE. Hogan & Hartson advised Onexim Group. Onexim Group, one of the leading Russian private investment funds, was founded in 2007 by Mikhail Prokhorov and has a diversified portfolio of investments in the metals and mining sector, financial services, energy and nanotechnology, real estate and other industries. Onexim Group and Mr. Prokhorov also support many sports, cultural and charitable programs in the communities in which we live and work. Forest City Ratner Companies (FCRC), a wholly owned subsidiary of Forest City Enterprises, owns and operates 30 properties in the New York metropolitan area. Forest City Enterprises, Inc., an $11.7-billion NYSE-listed national real estate company, is principally engaged in the ownership, development, management and acquisition of commercial and residential real estate and land throughout the United States. Statements made in this news release that state Forest City Enterprises’, FCRC’s or management’s intentions, hopes, beliefs, expectations or predictions of the future are forward-looking statements. Actual results could differ materially from those expressed or implied in such forward-looking statements due to various risks, uncertainties and other factors. Risks and factors that could cause actual results to differ materially from those in the forward-looking statements include, but are not limited to, the impact of current market conditions on our liquidity, ability to finance or refinance projects and repay our debt, general real estate investment and development risks, vacancies in our properties, further downturns in the housing market, competition, illiquidity of real estate investments, bankruptcy or defaults of tenants, anchor store consolidations or closings, international activities, the impact of terrorist acts, risks associated with an investment in a professional sports team, our substantial debt leverage and the ability to obtain and service debt, the impact of restrictions imposed by our credit facility and senior debt, exposure to hedging agreements, the level and volatility of interest rates, the continued availability of tax-exempt government financing, the impact of credit rating downgrades, effects of uninsured or underinsured losses, environmental liabilities, conflicts of interest, risks associated with developing and managing properties in partnership with others, the ability to maintain effective internal controls, compliance with governmental regulations, volatility in the market price of our publicly traded securities, litigation risks, as well as other risks listed from time to time in the Forest City Enterprises’ SEC filings, including but not limited to, its annual and quarterly reports. Brooklyn, NY – Tomorrow, ACORN’S Bertha Lewis, Brooklyn Borough President Marty Markowitz and other elected officials, community, labor and business leaders, along with religious organizations and youth groups, will outline their support for the Atlantic Yards development. Supporters will discuss the anticipated benefits of the $5.6 billion project, in particular the jobs (17,000 union construction jobs and over 8,000 permanent jobs) and housing (2,250 rental units for low, moderate, and middle income families). Brooklyn, NY – June 24, 2009 – Bruce Ratner, the Chairman and Chief Executive Officer of Forest City Ratner Companies, the developer of Atlantic Yards in Brooklyn, issued the following statement today following the MTA Board vote approving the project. Mr. Ratner explained too that Atlantic Yards will provide numerous benefits to the people of Brooklyn and the entire City, including 17,000 construction and permanent jobs; 6,430 housing units, 2,250 of which will be affordable; office space; an elementary and intermediate school; a health care center; an intergenerational center; eight acres of open space; and a new LIRR storage yard, and a new transit entrance at Atlantic and Flatbush Avenues. “We greatly appreciate the ESDC Board’s action today. The modified plan will allow us to proceed and at the same time ensure that the many benefits of Atlantic Yards become a reality. Mr. Ratner explained that the project benefits will include 17,000 construction and permanent jobs; 6,430 housing units, 2,250 of which will be affordable; office space; an elementary and intermediate school; a health care center; an intergenerational center; eight acres of open space; and a new LIRR storage yard, and a new transit entrance at Atlantic and Flatbush Avenues. “Today’s ESDC Board authorization means that we are one step closer to building the Barclays Center, a state-of-the-art 18,000 seat sports and entertainment arena that will be the home of the Brooklyn Nets basketball team and host over 225 diverse events throughout each year,” he noted. Ellerbe Becket is internationally recognized as a leader in the architecture, engineering and interior design industries. The firm’s sports practice specializes in the design of facilities that are renowned for providing outstanding patron experience. With offices worldwide, the firm has designed more arenas than nearly any other architectural firm, including 15 new arenas for the NBA and NHL in the past two decades. Ellerbe Becket brings together fans, athletes, and sponsors through the design of iconic venues that are efficient to build, own and operate. 2009 marks Ellerbe Becket’s 100th anniversary.